“Had we but world enough and time,/This coyness, lady, were no crime … Let us roll all our strength and all/Our sweetness up into one ball,/And tear our pleasures with rough strife/Through the iron gates of life:/Thus, though we cannot make our sun/Stand still, yet we will make him run.” The poet, with an opening that warns of choices unmade, opportunities unseized, urges his love, his “mistress,” to make love, to love, to seize this moment right now, right here; for life and love are fleeting. Carpe diem, LIVE, for tomorrow we may die. Thus begins and ends one of Miss Bates’s favourite poems, Andrew Marvell’s “To His Coy Mistress,” with its resignation to life’s ephemerality, “time’s wingèd chariot,” and in that urgency, that reminder of loss, its beauty. Reading Mary Ann Rivers’ Live, first in The Burnside Series, Miss Bates remembered and thought about this beloved poem because Rivers’ novel calls up those questions and ends up in the same place: on time’s precipice where we dwell and make our lives. Rivers’ has written a remarkable romance novel: beautifully, if obliquely, written; tormented as only youth can be; serious as only the un-ironic are; unabashed; explicitly sexual; yet, austere. 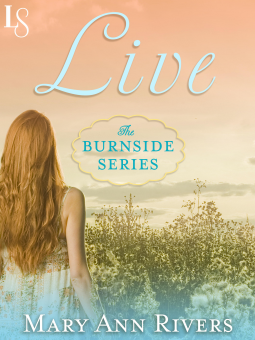 Rivers’ novel opens in a library in Lakefield, Ohio, where Destiny Burnside is wretched. She lost her father to cancer mere months ago; her mother when she was so young she’s without memories of her; her sister, Sarah, is badly and barely recovered from a near-fatal bike accident; her brothers, Sam and Paul, present, but the family disarrayed after their father’s death. She’s been months unemployed, near-destitute, and desperately being the good girl who puts her Humpty Dumpty of a family back together. She’s a trooper, spending hours in the library looking for computer work, work she’s good at, but there’ve been no bites to her queries. She’s at the end of her tether; she weeps and weeps and can’t stem the tide. Miss Bates thought of Laertes’ line, “Too much of water hast thou, poor Ophelia,” too much sorrow, one hardship too many, one burden too many. Hefin, ten years senior to Destiny’s 27, emerges from the stasis that has been his life when he takes her in his arms. MissB. loved the undaunted allegory of it: Destiny calls in the form of Destiny. At first, Hefin doesn’t recognize why he offers pancakes and comfort: “Hefin had no explanation for why he’d dropped anchor alongside this woman.” But sea and water imagery are right there, telling us why he did. Hefin feels a failure: his marriage ended when he withdrew from his American wife. He’d come to the US with high hopes, of success, of building a life with her; he’d left behind his adoptive parents in Wales and a stimulating job as an environmental engineer in Beijing. America did not meet his career aspirations; bidding for this library job was the first step to climbing out of the fear-filled hole he’d inhabited since his marriage’s end. In two months, at the end of the library commission, he’s returning to Wales to visit his parents and then on to China, to see through the end of his solar panel project. Hefin knows he must return, to set his life aright, to steer it back to its rightful course. Hefin’s doesn’t yet understand what has happened to him, “Sea change was just that, a change in the sea. Something to adjust the rudder against, watch for in the tides, nothing more. Inevitable, but not destiny.” But when Destiny calls, there needs be an answer. There is a beautiful and desperate physicality to Rivers’ descriptions of Hefin and Destiny: susurrus of blood and heart, internal tides joining and binding. But she never kills their will, or their freedom to choose. Though her narrative’s introspective, Rivers adroitly sustains tension throughout: the writing pulls us along, sometimes straining, barely able to sustain the characters’ pain; like a tight string on a violin, the reader thinks it’ll snap, she’ll lose the thread. It falters, lapses to lugubrious, but recovers; once more, buoyant. Secondary characters enter: enraged, unhappy Sam; fragile, snarly Sarah. The yearning and sexual tension between Hefin and Destiny, love scenes reminiscent of Delacroix’s great “Jacob Wrestling With the Angel,” are a-typical of romance fiction, interesting, organic to the story. MissB. was mesmerized. The pull-to of attraction, “vegetable” love, and desire are as strong as the push-away of self-affirmation, self-actualization, and obligation to family, the ones who “came before,” before you-and-I-trying-to-be-we. Then, Rivers delivered the coup de grace that ensured Miss B’s loyalty: hero and heroine know and love the work of Scottish artist, Andy Goldsworthy, have seen the documentary about him and his work, Rivers and Tides. MissB. loves this work and this film fiercely. When Goldsworthy’s art enters the novel, as Hefin’s time in Lakefield shrinks and he and Destiny near a reckoning, time’s fleeting nature is brought to the foreground with greater urgency. Goldsworthy’s work is about this notion. He makes art out of nature’s detritus, spends hours and hours collecting twigs and bits, creates a stunning art-piece, knowing that, nay inviting time and tide and wind and rain to destroy it. Even when he creates works of art out of stone, it is with the idea that they will carry the ravages of time, through erosion or other alterations. His is one of the most profound ideas of art working today (you may read more about him here and watch the great documentary about his work, Rivers and Tides.) Goldsworthy’s art may be about time, but it is also about place. Time runs dry for Destiny and Hefin because they belong to different places. These places ground them: their roots are deep and strong and … on opposite sides of the world. What it takes for Destiny and Hefin, like a boat afloat, to find a lull where they can build a life is to acknowledge time and tide, nature as creator and destroyer, to live in its interstices, like this Goldsworthian image of their love-making, “They wove their legs together like a wattle of twigs.” In the tiny backyard that Destiny enjoys, she tries to build a wattle-twig dome, as Goldsworthy does with driftwood, or twigs on the ground. Before Hefin’s departure, he completes and gifts it to her. What happens to her in that dome cements her decision. If he was a singing man and poet, he might have serenaded her, “Make me a willow cabin at your gate,/And call upon my soul within the house” (Twelfth Night 1.5.242 – 43). In Mary Ann Rivers’ Live, there is “no charm equal to tenderness of heart,” Emma. Live, published by Loveswept, is available, as of January 21st, in e-form, at various vendors. Miss Bates is grateful to (Random House) Loveswept for an e-ARC, via Netgalley, in exchange for this honest review. As you can see I’m perusing your old blog posts LOL. I loved this book , loved loved loved it. One of my absolute favourites.